of War Department. On December 3lst, 1918, the remaining four civilian flying instructors at Rich Field were discharged from the service of the United States by a War Department order. They took their last flight, were given a hearty send-off by the officers and enlisted men of the field, and Rich Field knew them no more. But the honorable record which they have made will stand as long as Rich Field graduates foregather -- and no four names will have more mention in future reunions of flyers from Waco than those of Henry C. (Pop) Keller, George B. (Rock) Weaver, James P. (Jock) Mc-Grath and A. Walter Claverie. James P. McGrath James P. (Jock) McGrath, who lives at 15 Hurd Road, Brookline, Mass., when at home, was born at Dunhill, Bally Crodick, County Waterford, Ireland, on March 17, 1888, and was regarded as Rich Field's most finished flyer. He received his license to fly from the Aero Club of France in February, 1912. He was at the Bleriot School at Pau and Etamps, France, in 1912, and also was graduated from the Deperdussin School at Mourmel-on-LeGrand, France. In 1913 he came to the United States as an exhibition flyer for the Burgess Company, and has had more than 1500 hours in the air. Editor's Note: The article was kindly submitted by Henry Keller's great-nephew, Ken Folse. Transcribed by Bob Davis - 8-17-04 "An attractive but unexpected feature was added to the Tri-State Fair by Frank D. Fuller, secretary, yesterday. He closed a contract with James McGrath, a renowned aviator, for two flights. One will take place Saturday and the other on Sunday, Sep. 28 and 29. The airship is of interest locally. It is owned by E. J. Marley of Sumner, Miss., and is said to have cost $11,000. McGrath has had experience as an aviator in France and in various parts of the United States. He is a member of the International Federation of Aviators and received a certificate from the president of the commission of aeronautic sports in Paris. McGrath is said to have made some daring flights and distinguished himself on many occasions on account of his coolness and nerve. He promises to afford those who visit the fair grounds an opportunity to witness sme flights that no other aviator has yet offered the Memphis public. While much work of preparation remains to be done. Mr Fuller said yesterday that the fair would be in readiness by Monday morning." 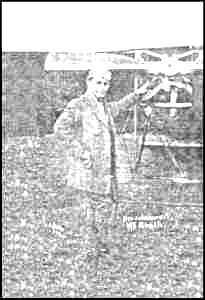 "He will use the $11,000 monoplane which has been stored at Sumner, Miss., for some time. McGrath has flown extensively in France and in the United States, and will give the visitors at the fair something worth while. The contract signed yesterday calls for real flights on next Saturday and Sunday."